It’s been almost two years since I moved from Belfast, Maine to Houston. During this period I have spent most of my time trying to become acclimated to my new surroundings. When you come to live in a city so expansive in its geography, it’s kind of hard to figure out where in Houston you want to be. 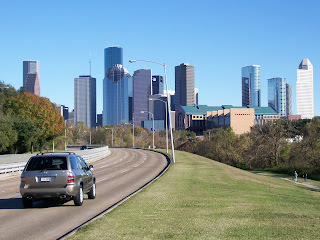 There’s the Heights, Montrose, the Galleria, Downtown, the Medical Center, the Museum District, and the list goes on. Each area mentioned is large enough in size and population to be its own city. And if you were to isolate the Medical Center by itself, you would have the ninth largest city in the United States. Needless to say, getting lost in Houston is very easy to do. But I’ve gotten to where I now have a general sense of what direction I’m going in whereas before I couldn’t tell east from west or north from south. The distraction of trying to become comfortable with a new job and a new place to live unfortunately doesn’t contribute to getting much writing done. But I’ve become comfortable in my new apartment, and have a screen to my sliding glass door that lets in a good supply of fresh air. I hung a three foot long wind chime just above my patio door that creates the perfect background noise for reading a book, or for sitting down to write. While lost in distraction these past few years, I’ve spent more time watching TV than I normally would. Becomes a habit that’s hard to break sometimes. But I can only take so much mindless absorption before I’m completely bored. A couple of weeks ago I decided to turn off the television and become reacquainted with my thoughts. First thing I thought I’d do was dust off my blogsite and bring it up to date. That’s when I learned Blogger made a switch in its formatting, and as such, I couldn’t log into my site. Tried everything I could think of and spent hours trying out different suggestions I found by researching the internet. Even sent Blogger a couple of nasty emails to which I have yet to receive a response. Finally I gave up and recreated my blog by switching to a new URL. Unburned Pieces of the Mind still shows up under http://dog1net.blogspot.com/. However, I can’t post to it anymore. So I copied the source code and recreated my blog that now uses the following URL: http://www.slcunningham.com. The next hurdle to overcome is with getting everyone linked to my old site to hitch up to my new site. Why Blogger had to make something relatively simple and easy to use so extremely difficult and frustrating is beyond me. Anyway, getting late. We had a good line storm that came through this morning with lots of rain, lightening and thunder. It’s a little on the cool side tonight but the sky is a dark cobalt blue . Think I’ll grab a Linda Ronstadt cd and take a drive through downtown. On a night like this, all the buildings will be perfectly lit up against the sky. After driving down Smith Street, I’ll head over to the Pie House on Kirby and sit myself down to a cup of coffee and a big slice of egg-custard pie. I'm delighted to see you! Here I am spending most of my time in . . . a whole new place, yet every month or so, I'd go looking for signs of you. Check this out SOBCon08 Wish you were going to be here for that. I'm so delighted to see you!! SOBCon08 sounds really cool. I wish I could attend, but if there's a next time around, I'll definitely plan on it. Took awhile to get back to where I am with my blog. What a nightmare blogger made for me with the switchover. My old url still exists but I can't access it. But I think my new url suits me just fine, and once I find everybody again, I think I'll be up and running like before. So good of you to stop by. So good to see you, Scot - I thought you had disappeared forever into the wilds of Texas. Wyrfu had me guessing for a second, but I guess I'm not the only one who's experienced problems with Blogger's changeover to Beta. Good to see you check in Clive. "What a nightmare blogger made for me with the switchover. My old url still exists but I can't access it." That's one of the reasons why I switched to WordPress on my own domain. It's great to have you back, Scot. I can't believe it's been two years! Scott - so nice to have you back. can't believe it's been 2 years!! Thanks for stopping by. Good to be in your company again. Amazing how two years can go by. All the more reason to use the time you have as productively as you can. I had no idea of the size of Houston, so I'm finding that fascinating, and I love the idea of your being inspired by a windchime. When I had my last significant birthday, my mother gave me a set of cathedral chimes that reach almost floor to ceiling and react amazingly to my cat's tail, and my granddaughters' dancing. So I can relate. Guess that's quite a snooze. Anyway, good to have come by. A windchime can have an amazing calming effect, that is, when there's a light breeze. Hey Scot, thanks for looking me up too. Glad you're back! Good to see you both check in. It's been quite a hiatus for me, but I'm getting back into a more comfortable routine of writing and expect to be posting and making the rounds more often. I am a little late to the party, but let me welcome you back none the less heartily. I am bookmarking the new URL and will get it added to my old site, and perhaps one or two of my new ones. Thanks, good to see you come by. I've always liked your old blog, and I will be curious to see what your new blogs are about.